Like homemade coleslaw? Looking for a way to make it vegan? Here's how to make a traditional American-style coleslaw suitable for anyone on an egg-free or vegan diet. You can easily make this simple homemade vegan coleslaw recipe - it's egg-free and dairy-free - for a picnic, potluck, or a vegetarian or vegan barbecue by using vegan mayonnaise instead of regular mayonnaise or store-bought dressing. Like many traditional dishes, there's really no wrong or right way to make coleslaw, so if you're used to doing it somewhat differently, feel free to experiment and change up this recipe a bit, or, scroll down for more even more creative vegan coleslaw recipes to try out. This simple vegan coleslaw recipe is also completely gluten-free. Whisk together the vegan mayonnaise, vinegar, sugar, soy milk, salt, and pepper until smooth and creamy to form a dressing. 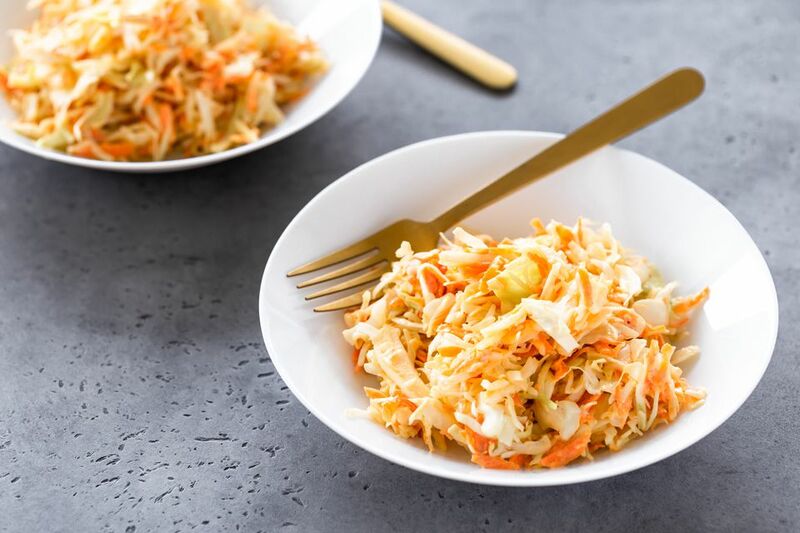 In a large bowl, combine the thinly sliced cabbage and the grated carrots, and add the mayonnaise and vinegar dressing, tossing it all together to combine well and to make sure that the all of the cabbage and carrots are evenly coated with the dressing. Allow your vegan coleslaw to chill in the refrigerator for at least 2 hours before serving, if you have the time, and longer is just fine. To serve, remove from the refrigerator and give it a quick and gentle toss to mix up all the ingredients and the dressing a bit. To store any leftover coleslaw salad you have, transfer to an airtight container and place in the refrigerator immediately. Leftover coleslaw can keep up to 1 to 2 weeks if stored properly. Salad recipes: Bean salads, pasta salads, fresh healthy green salads and much more!